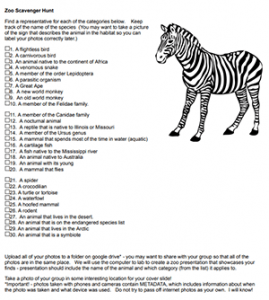 This is a list of animals that can be found in most zoos, though the list uses descriptors like “aquatic mammal” or “animal that lives in the desert.” The goal was for students to find animals from the list and photograph them with their cell phones. We would return to class and share all of the photos and compile them into an album. The list could be modified to work with just a small group or even a single zoo explorer. I haven’t been able to take my class to the zoo for several years due to budget cuts, but I thought this list might work for other teachers or parents looking for summer activities. To modify, use the google doc link below and copy to your own drive and then you can change the list. The list was not intended to be completed, that would probably take a very long time, but if multiple groups focus on certain areas of the zoo, we were able to get most of the animals photographed. I do recommend that you have students also snap a picture of the placard where the animal was located, as it can be difficult to remember the name of the animal when you are back at class. With other social media options, you could also modify the instructions and share on Flickr or Instagram. The list was based on animals found at the St. Louis Zoo, though I think it’s fairly typical for most zoos. It may also be possible to do a virtual tour of a zoo and find the animals that way.